Raw potatoes are brought into the plant in the receiving area where they are washed to remove plant material, dirt and stones. To make the best possible use of the raw materials the potatoes are next sized. 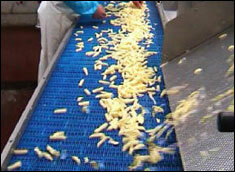 Large potatoes are separated for use on French fry production lines. 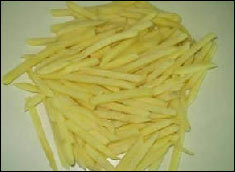 Smaller potatoes are used in specialty items or french fries not requiring long length. Peeling and scrubbing comes next; high pressure steam loosens the potato skins. 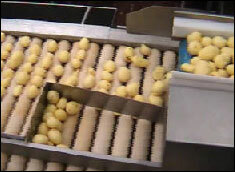 Any remaining skin is removed by automated brush peelers. 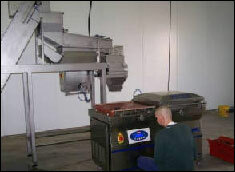 The potatoes then move to the trimming area where gross defects are removed by hand. The final stage before cutting is pre-heating, where the potatoes are slightly softened by heating them in water. 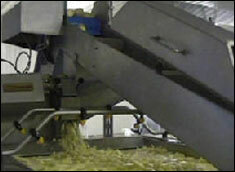 This vital step prevents the potatoes form shattering during the cutting process. The potatoes are sent through a set of knives and are cut into fries of the desired dimensions. Defects are removed from the freshly cut fries using a sophisticated electronic system that detects dark spots and triggers a series of knives that slice away the defective spots. The fries are then graded by length before moving to the blanching process where they are dipped in warm water to deactivate enzymes that can cause discoloration. The fries then move through a dryer, where warm air is circulated to quick dry the surface of each fry, before they are deep-fried by the fryer. Pre-cooling and freezing come next followed by length grading and final inspection. 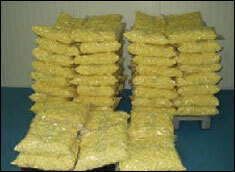 The finished fries are ready for packaging and are then placed in cold storage in preparation for shipping. 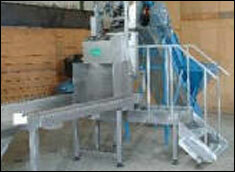 This entire process is monitored and controlled with a distributed PLC/HMI system. This control system also operates the utility systems for steam generation, refrigeration and waste water treatment as well as facility subsystems including HVAC and lighting. This description is of an ideal facility. Project designs are however arrived at with customized requirements to suit project plans and cost outlays. 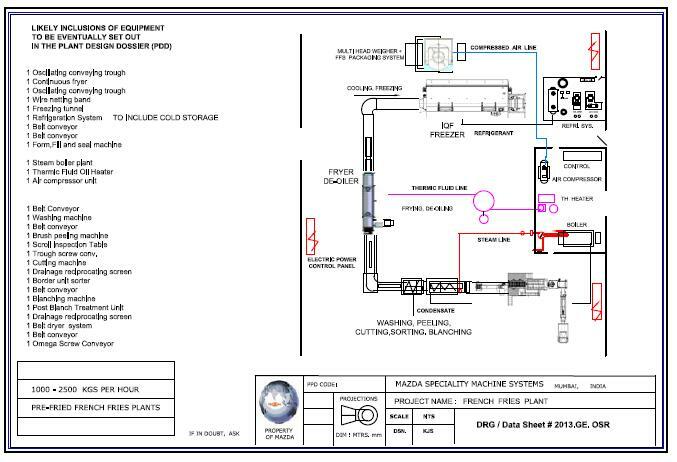 Our production lines are also offered for potato flake lines, and are usually set up in one of two ways, the first is a primary process the second being a line to use waste potato from another primary process line such as a French fries line. 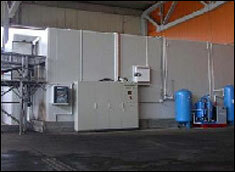 In the first instance a specialized potato flake line is developed to convert potatoes that have been specifically sourced for manufacturing flakes. In the second instance a flake line is installed along side an existing process line, for example a French fries line, the waste potato from the French fries line is used as a raw material to convert to a saleable quality of flakes. This method is a very good way of improving the overall yield of a processing facility as material which previously would have been discarded as waste, is now converted to a saleable product. 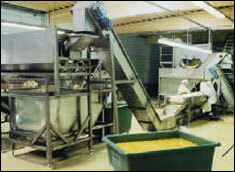 Potato powder and flour are related products. Palletized snacks are produced when the raw material is extruded into a recognizable shape; this can be done using a process known as direct expansion or alternatively using a process known as indirect expansion.